Eds. Note: Please scroll to the bottom of this post to see links to discussions of A Birthday Cake for George Washington. The links are in two sets. The first is to items upon the release of the book. The second set is to items following Scholastic's decision to withdraw the book. Back in November or December, I started to hear that people in children's literature were wondering what we (by we, I mean people who objected to the treatment of slavery in A Fine Dessert) would say about the smiling slaves in a book due out this year. 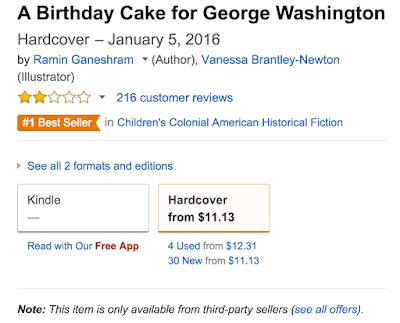 That book, A Birthday Cake for George Washington, is out now. It felt, then and now, too, like the people who think A Fine Dessert is ok were waiting to pounce on us. The line of reasoning is this: if the smiling slaves in A Fine Dessert were not ok, then, the smiling slaves in A Birthday Cake for George can't be ok, either. It seemed--and seems--that a test is being put forth. If we don't slam A Birthday Cake, then, our critiques of A Fine Dessert can be ignored. A predominantly white institution filled with predominantly white people with hundreds of years of power to determine what gets published is waiting to pounce on people of color if they don't pounce on other people of color. I ordered A Birthday Cake for George today. I'll study it. I may--or I may not--write about it. What I want to focus on right now is power and the investment in that white narrative of the US and its history. Smiling slaves in picture books that, in some way, depict slavery are a parallel to the smiling Indians in picture books set in colonial periods. Those smiles sell. They tell kids things weren't all that bad for those who lived in slavery or those whose communities were being attacked and decimated by those who wanted their land--in many instances--so they could turn those lands into plantations of... smiling slaves. People in the US are so determined to ignore the ugly history of the US that they churn out narratives that give kids a rosy picture of US history. 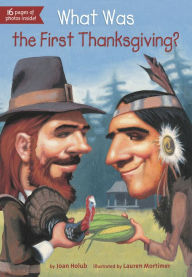 Some of you may recall a post here a few years ago, written by a 5th grade girl named Taylor: "Do you mean all those Thanksgiving worksheets we had to color every year with all those smiling Indians were wrong?" That expectation that we have to throw the team that did A Cake for George Washington under the bus is (saying again) disgusting. Do Native and POC mess up? Yes, we do. We're human beings. Do we want Native and POC who create children's books to do right by our histories? Of course. The fact is, we're peoples who've been through hell, and survived. Persisted. Indeed, we've thrived in spite of all that got--and gets--thrown our way time and time again. In whatever ways we choose to write or speak about A Cake for George Washington, I think we'll be doing so from a space of care for each other, because publishing (and Hollywood, too) aren't all that welcoming of the things we want to give to children. Native and POC are, collectively, at a disadvantage. We face difficult decisions at every turn. Native actors need exposure so they can build profiles that give them power to impact what they do the next time, and what those behind them can do, too. Native writers and POC are in that same position. The stakes are high--no matter what one decides to do. Those stakes aren't necessarily the same for white actors, writers, and illustrators. One of the most important children's books I've read is Simon Ortiz's The People Shall Continue. It is about working together so that we all continue, as people who care about each other. With that in mind, I think the ways that we respond and write about A Cake for George Washington may disappoint those who are waiting for our responses. Jan 14, 2016. "The First Bite: Slicing Through A Birthday Cake to Reveal Layers of Truth" by Ramin Ganeshram (author of book) at CBC Diversity. Jan 15, 2016. Scholastic's "Response on a Birthday Cake for George Washington" at the Scholastic blog, On Our Minds. Jan 15, 2016. "NOT Recommended: A Birthday Cake for George Washington" by Allyson Criner Brown at Teaching for Change. 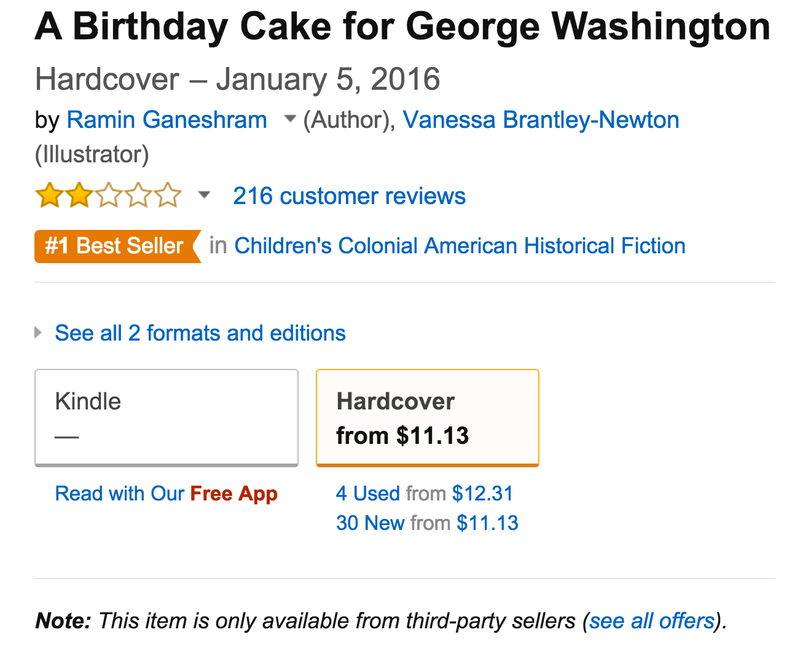 Scholastic is announcing today that we are stopping the distribution of the book entitled A Birthday Cake for George Washington, by Ramin Ganeshram and illustrated by Vanessa Brantley-Newton, and will accept all returns. 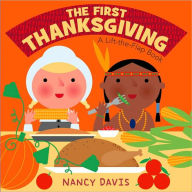 While we have great respect for the integrity and scholarship of the author, illustrator, and editor, we believe that, without more historical background on the evils of slavery than this book for younger children can provide, the book may give a false impression of the reality of the lives of slaves and therefore should be withdrawn. Below are links to items specific to their decision. I am placing Ebony Elizabeth Thomas's Storify in a larger font because I believe it is the single most important response to #SlaveryWithASmile. Today (Jan 22) I am inserting Freeman Ng's page-by-page synopsis at the top of the set of links for those who wish to begin their reading with more information about the contents of the book. Page-by-page synopsis with screen captures, of A Birthday Cake for George Washington, by Freeman Ng. Jan 17, 2016. "New statement about the picture book 'A Birthday Cake for George Washington'" at the Scholastic blog, On Our Minds. Jan 18, 2016. "Children's Literature About Slavery: The Struggle Continues" by Ebony Elizabeth Thomas, at Storify. Jan 18, 2016. "Happy Martin Luther King Jr. Day: Let's Have Some Cake" by Elizabeth Bird at School Library Journal. Jan 18, 2016. "A Bumpy Ride" by Roger Sutton at Horn Book. Jan 18, 2016. "Smiling Slaves at Storytime" by Paula Young Lee at Salon. Jan 18, 2016. "Under Pressure, Scholastic Recalls Racist Children's Book" by Deborah Menkart, at Huffington Post. Jan 18, 2016. "Scholastic pulls children's book showing George Washington's slaves smiling." CBC Radio's interview of Edi Campbell. Jan 18, 2016. "Scholastic Pulls Children's Book For the Way it Depicts Slaves" by Sara Jerde at Talking Points Memo. Jan 18, 2016. "Scholastic Inc. Removes "A Birthday Cake for George Washington" from Shelves by Jennifer Baker at Forbes. Jan 19, 2016. "No Text is Sacred" by Megan Schliesman at Reading While White. Jan 22, 2016. "Controversial Picture Books Struggle to Help Children Understand Slavery." by Eyder Peralta at NPR's All Things Considered (features Alison Criner Brown, Ebony Elizabeth Thomas, and Matt de la Pena). Jan 22, 2016. "#SlaveryWithASmile" podcast on the Ferguson Response Network; guests include Mikki Kendall, Roni Dean-Burren, Edith Campbell, and Allyson Criner Brown. Jan 22, 2016. "It's Not Censorship" Storify by the Zinn Education Project, comprised primarily of Daniel José Older's responses to joint statement from the National Coalition of Censorship, the PEN American Center, and the American Society of Journalists and Authors. Jan 22, 2016. "Take the cake." by Jamie LaRue at the American Library Association's Intellectual Freedom blog. Jan 23, 2016. "On Censorship and Slavery." Storify by Daniel José Older. Jan 23, 2016. Updates to "A Birthday Cake for George Washington." Storify by @LeslieMac of the National Ferguson Response Network. Jan 25, 2016. "Statement from Scholastic on Claim of Self-Censorship by Advocacy Groups" at the Scholastic website. Jan 25, 2016. "Whips AND Chains" by Roger Sutton at Horn Book's Read Roger blog. Jan 26, 2016. "Dear Scholastic: Given Your Statement about Standards..." by Debbie Reese at American Indians in Children's Literature. Jan 26, 216. "Have you been following the "A Birthday Cake for George Washington" Controversy? by Lin Oliver, Executive Director of the Society of Children's Book Writers and Illustrators. Jan 29, 2016. "The real censorship in children's books: smiling slaves is just the half of it" by Daniel José Older at The Guardian. Jan 31, 2016. "Wrestling with a Birthday Cake for George Washington as a Mother and a Librarian." by Karen Jensen at School Library Journal. Feb 8, 2016. "We Will Continue to Raise Our Voices: Survival, Slavery, Censorship" by Daniel José Older at School Library Journal. Feb 8, 2016. "You Don't Show the Sweet Without the Bitter" by Sarah Hannah Gómez at School Library Journal. Feb 8, 2016. "So People Disagree. Is This a Problem?" by Joan Bertin at School Library Journal. Feb 9, 2016. "The Dangers of Self-Censorship" by Chris Finan at the American Booksellers Association. Feb 11, 2016. Leslie Mac's video on Facebook, rebutting Ganeshram's article at Huffington Post. The book is no longer available at Amazon. See the last line in this screen capture, taken at 3:12 PM on January 18, 2016. Around 4:00 PM on January 19, 2016, the price of the book on Amazon got a bit inflated. It went away pretty quickly. I doubt it sold. Someone at Amazon must have... removed the private seller's account. I found it interesting when I looked on Amazon that the School Library Journal gave the book a very negative review, but the readers did not. I rather trust the professionals more. In the end I think withdrawing this book was the right choice, but that said. I am disappointed at how this whole incident played out. Questions about this manuscript should have been raised earlier. This book would have been read by dozens of people before it went into production. Failure at every level. Part of me would like every person who approved this book along its journey named. Right now we are only seeing the three WOC who created it - author, illustrator and editor. Who else saw it and said "Okay. Good."? I feel the same way about "A Fine Dessert". For that we were all asking "didn't they consult some African American readers?" I felt at the time that they probably did and those readers saw no problem. But who would admit to that after the fact? Pinkney-Davis, Brantley-Newton and Ganeshram can't hide from their missteps here. Who else is brave enough to step forward and say "mea culpa"? Finally, now that we have this result, I would love some bloggers to write about how these books could have been saved. Specific ideas, because that is obviously what is needed.